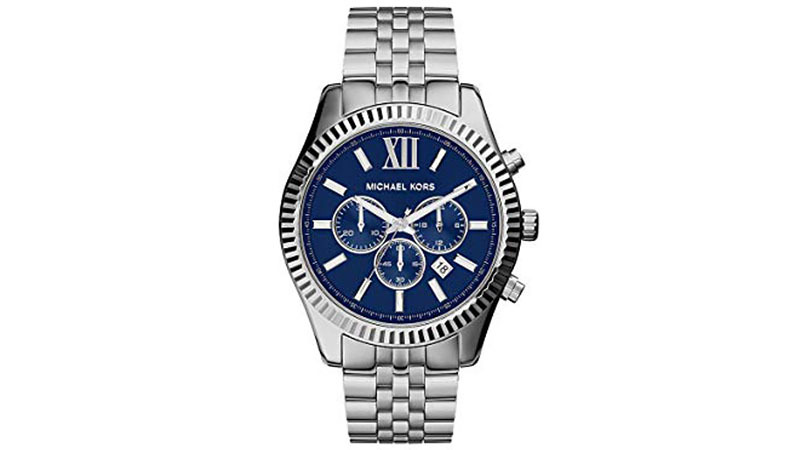 When it comes to watches, Michael Kors offers many stylish and affordable options. 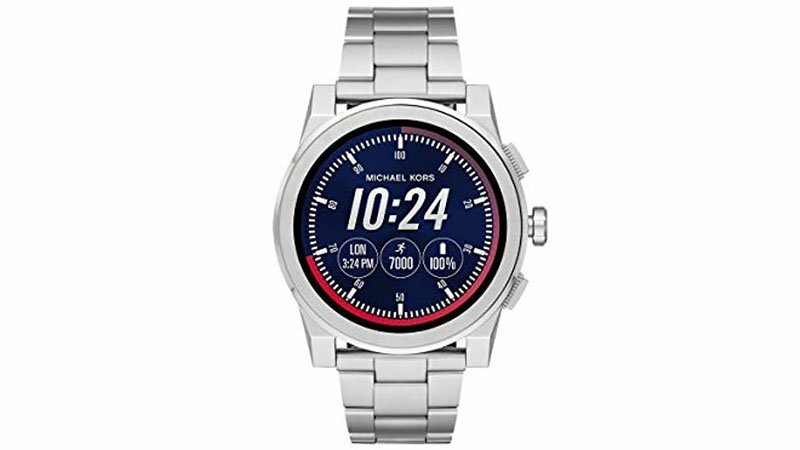 From the revolutionary Grayson Smartwatch to the iconic Lexington, we’ve rounded up the best watches from Michael Kors for you to add to your dream collection. 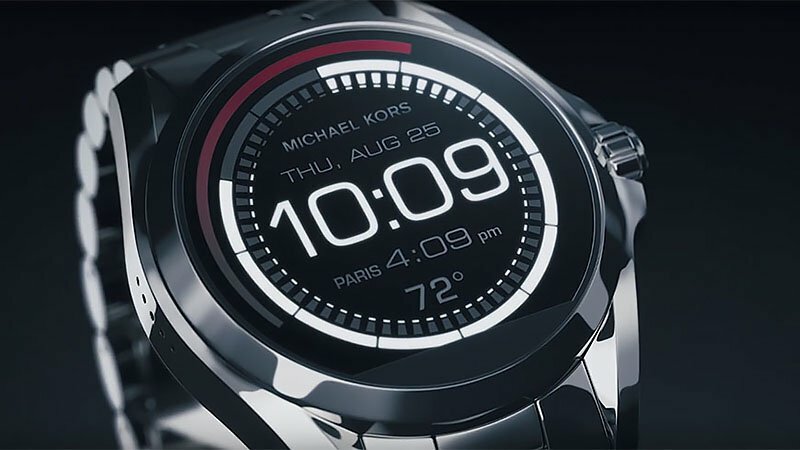 The Michael Kors Grayson Smartwatch merges luxury with a sporty finish. A stainless steel band comes together with a 47mm silver case for a flawless finish. The timepiece features a high-definition display face and rotating crown for quick scrolling through apps, watch faces and more. It also includes smartphone notifications and touchscreen functionality as well as activity and goal tracking. Powered with Wear OS by Google, the timepiece has an estimated 24 hours of usage before needing a recharge. This expertly crafted smartwatch also incorporates Bluetooth and WiFi into its design. Details like a sporty, oversized chronograph dial give the Michael Kors Bradshaw Chronograph Watch a bold look. The thick bracelet features polished and brushed links for a runway-inspired touch. Along with being water resistant to 100m, the black stainless steel timepiece utilises a Quartz movement. Additional features include Roman numeral hour markers, chronograph functions, a protective 42mm stainless steel case with mineral dial window, analogue display and fold-over clasp with double push-button safety closure. As sophisticated as it is stylish, the Michael Kors Lexington Watch is the timepiece missing from your collection. The silver-tone watch features a textured coin-edge bezel and blue sunray dial with date window and three chronograph subdials. Utilising durable features such as a Quartz movement with analogue display and a 45mm stainless steel case with mineral dial window, you can enjoy peace of mind. With water resistance to 100m, this timepiece is suitable for swimming and snorkelling, but not scuba diving. Other notable features include a stainless steel band with deployant clasp as well as stunning silver-tone markers. 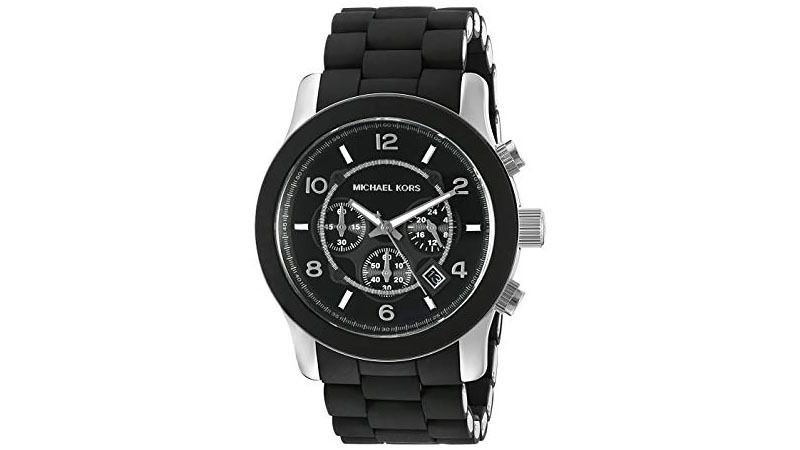 Comfort and function meet fashion with the Michael Kors Dylan Watch. This stylish timepiece offers unmatched longevity, featuring a 45mm stainless steel case, durable mineral crystal to protect the watch from scratches and a 2-year warranty. Plus it is water resistant to 100m, suitable for snorkelling as well as swimming. The beautifully designed timepiece offers a lightweight and casual design, pairing a classic matte and shiny black case with a black silicone strap. Finally, it features a buckle clasp closure, stationary bezel function and precise analogue Quartz movement. With a striking navy sunray dial and classic two-tone metal, the Michael Kors Bradshaw Watch is an impressive timepiece sure to turn heads. The watch features a date window, and three chronograph subdials, as well as a 43mm stainless steel case with mineral dial window. It boasts a Quartz movement with an analogue display for an easy-to-read design. A mixed-metal finish and Roman numeral markers lend elegance to this chronograph watch, and polished gold-tone links complete the sophisticated look. Finally, a fold-over clasp with double push-button safety and scratch resistant mineral crystal ensure a resistant design. 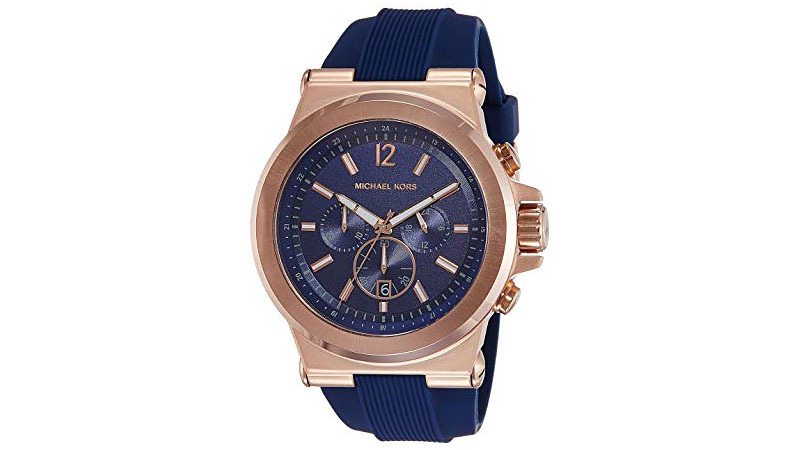 Designed for the elegant man on the move, the navy blue Michael Kors Dylan Watch is perfect for everyday casual use. The timepiece features a comfortable silicone band with a ribbed texture down the centre, an adjustable buckle closure, and a rose gold-tone stainless steel case that creates a rich, two-tone look. This chronograph watch is detailed with scratch resistant mineral crystal, a smooth round bezel and dark blue dial with a minute track. It also features three subdials, hour markers and a three-hand analogue display with luminous hour and second hands. As well as harnessing a Quartz movement, the timepiece is suitable for swimming and snorkelling with the ability to withstand water to 100m. 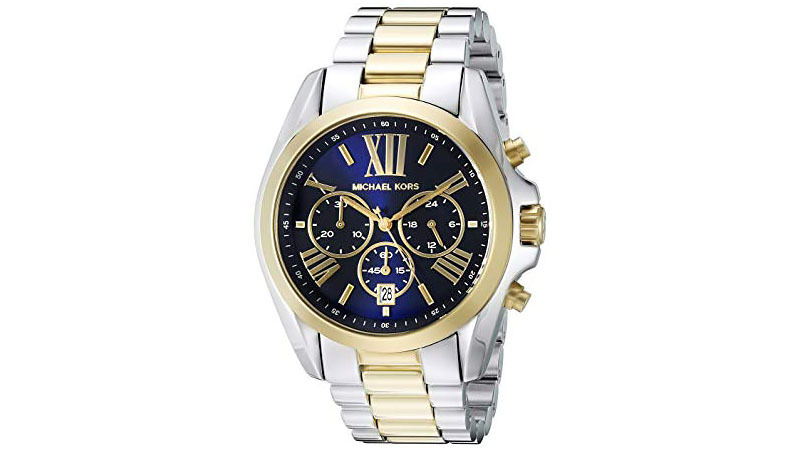 The Michael Kors Chronograph Sports Watch is the ultimate accessory for the adventurous outdoorsman. The stylish monochromatic timepiece in gunmetal-tone features a trio of subdials, date window and alternating Arabic/baton hour markers. 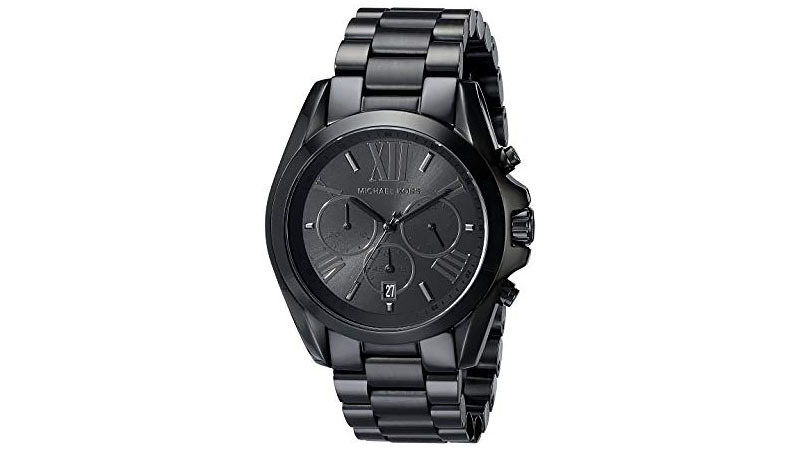 A black band is paired with a black dial for a bold yet stylish finish. Harnessing a Quartz movement, this watch can withstand water up to 100m, making it suitable for swimming and snorkelling. The timepiece is built for endurance, with a 45mm ion-plated stainless steel case with mineral dial window and foldover clasp with double push-button safety. 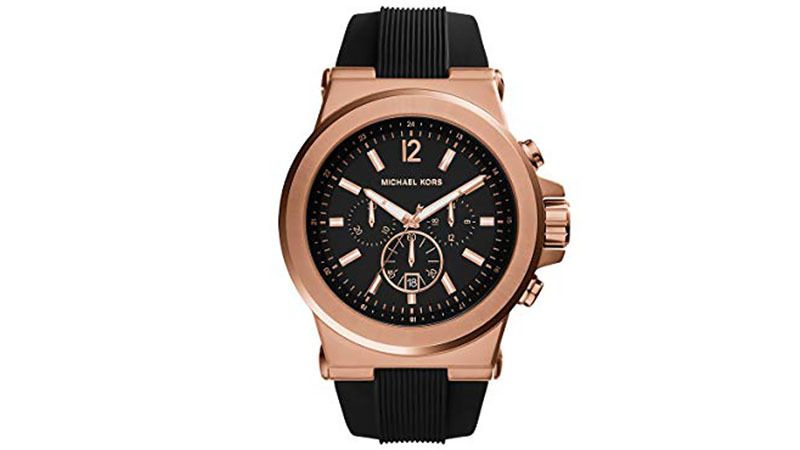 With a stunning rose gold finish, the Michael Kors Dylan Watch adds a touch of contemporary style to any modern man’s wardrobe. The timepiece features a ribbed black silicone band with buckle closure and a large round case with a stainless steel case back. 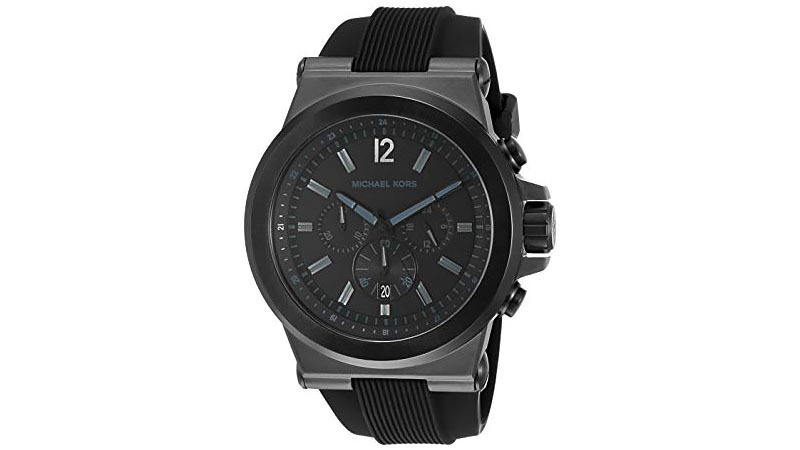 Aesthetic features include a sleek round dial with a black background, hour markers, a chronograph function and three subdials with a small Michael Kors logo and a convenient date display window. The dial features a three-hand analogue display with precise Quartz movement, as well as sturdy mineral crystal to protect the watch from scratches. Looking for a watch that is as functional as it is fashionable? 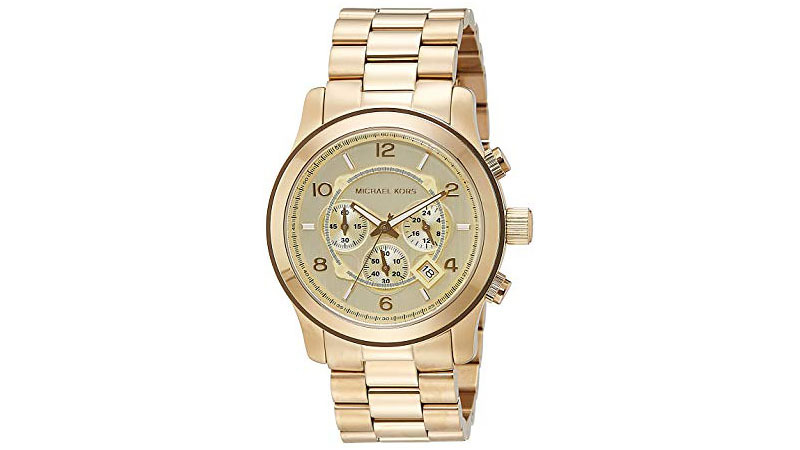 Look no further than the Michael Kors Runway Chronograph Watch. The timepiece boasts a Quartz movement with analogue display and is able to withstand water up to 100m. This dramatic timepiece features a beautiful, gold-toned stainless steel band that joins to a stainless steel case. A smooth, gold-toned bezel frames a gold-coloured dial, creating a stylish, monochromatic look. The watch also includes a fold-over clasp, double push-button safety, luminous hands and indices and three chronograph subdials. 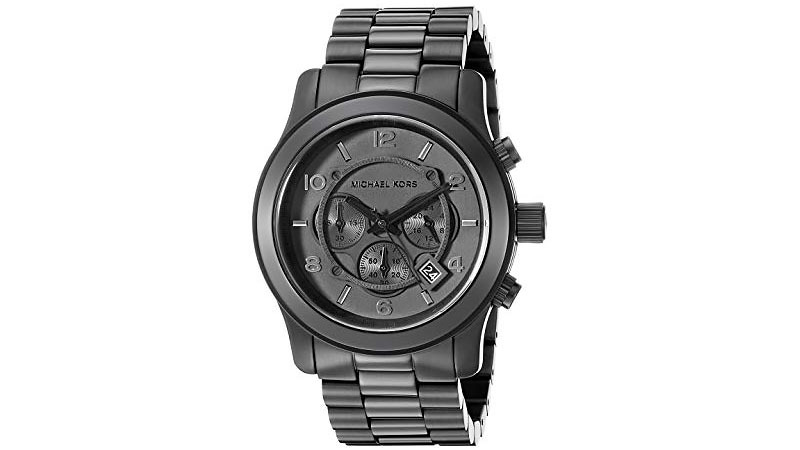 The Michael Kors Chronograph Watch MK8107 combines impeccable styling with a chic design. Its polished stainless steel glimmers with class and style, yet its black-anodised bezel and dial cloak the watch in stealthy intrigue. A rubberised link-style band completes the look. However, the dial is where this watch comes into its own: Black with polished numerals that alternate with luminous hour markers, the look is precise, clean and uncluttered. Within this functional design are three black, spiralled-textured subdials that provide dual time zone and stopwatch functionality. A date window is also a subtle part of the design. The timepiece features a durable mineral crystal, precise Quartz movement, and water resistance to 100m.